WORLD CLASS ADDRESS, WORLD CLASS VIEWS! 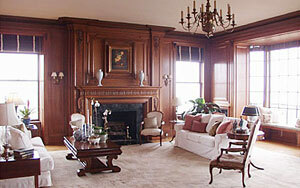 The classic apartment house at 2006 Washington Street was designed by renowned architect, C.A. Meussdorffer in 1924. It is set in a beautifully landscaped garden with a brick driveway turnaround, paved in a brick herring bone pattern, which leads to the portico and handsome lobby. Apartment No. 9 is a full floor apartment which enjoys truly world class views from the ninth of ten stories high atop Pacific Heights. The views encompass the Golden Gate Bridge, Alcatraz Island and the Bay Bridge, dazzling City lights and the verdant greenery of Lafayette Park. The floor plan is ideal for elegant entertaining on a grand scale and comfortable City living. The gracious, beautifully proportioned public rooms are paneled in rich mahogany with high ceilings, deep crown molding and lovely parquet floors in the Versailles pattern. Enter the VESTIBULE to the gracious RECEPTION HALL with Guest Closet and Powder Room. The cozy LIBRARY with fireplace is a comfortable space for intimate conversation and relaxed reading. 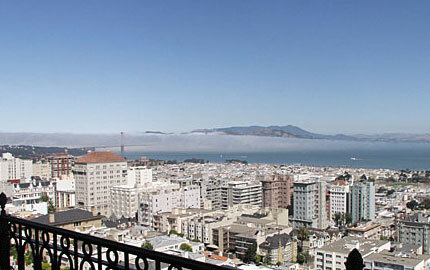 One can enjoy the marvelous view of the Spreckels mansion and Golden Gate Bridge to the west. The magnificent LIVING ROOM features an ornate wood and marble fireplace, chandelier and two oversized bays with French doors that open to the expansive north TERRACE with panoramic bridge to bridge views. The fine wood craftsmanship of the walls house the splendid view DINING ROOM, also with terrace access, is a perfect setting for elegant dinners. Nob and Russian Hill can be seen from the spacious KITCHEN with BREAKFAST AREA & butler’s pantry. This space awaits the new owner’s custom installation. LAUNDRY ROOM and service elevator adjoin. The wide U-shaped GALLERY leads to the private quarters. It contains floor to ceiling bookcases on one side and ample wall space for art and family photographs. 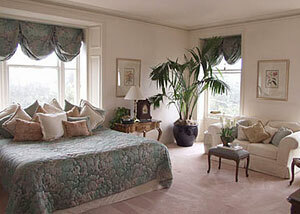 The private quarters comprise four sunny bedrooms and four bathrooms. All the bathrooms are of the timeless and classic 1920s era, featuring porcelain pedestal sinks, deep tubs, handsome marble floors and ceramic tile surrounds. The sunny view MASTER SUITE looks over the greenery of Lafayette Park and west to the Presidio and the Golden Gate Bridge. ‘HER’ BATHROOM features a large dressing room and ample wardrobe closets. ‘His’ BATHROOM has a tub and separate shower, and adjoins the dressing room, which conveniently accesses his OFFICE. The south facing BEDROOM overlooks Lafayette Park and has an adjoining FULL BATH. The southeast ‘morning’ BEDROOM overlooks Lafayette Park and features a solarium alcove from which to enjoy views of the bay and Russian Hill. East GUEST BEDROOM and FULL BATH. East MAID’S ROOM or SEWING ROOM. HOA DUES. $4,000 per month, includes: Insurance (including earthquake), water and scavenger. Utilities are billed separately every six months. Seller’s Property Disclosure Package available on request. Taxes to be reassessed to approximately 1.117% of the sales price.